DV50K7500EV: How can I level my Electric Front-Load Dryer, 7.5 cu.ft (DV50K7500EV)? To ensure optimal performance, the dryer must be level. 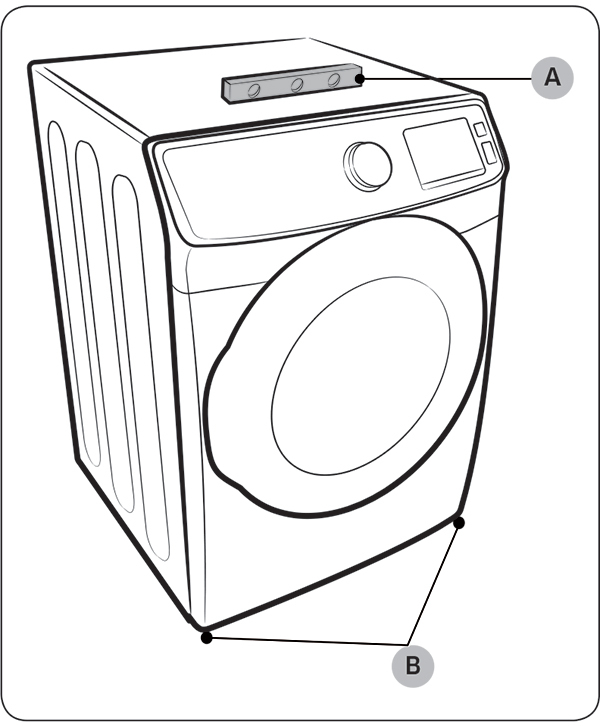 Using a level (A), check if the dryer is level side to side and then front to back. If the dryer is not level, adjust the leveling feet (B) at the bottom of the dryer. Then, check if the dryer is level again. To set the dryer to the same height as your washer, fully retract (A) the leveling feet by turning them counterclockwise, then loosen (B) the feet by turning them clockwise. Once the dryer is the same height as the washer, follow the directions above to level the dryer. Warning: Adjust the leveling feet only as much as necessary to level the dryer. Extending the leveling feet more than necessary can cause the dryer to vibrate. Electrical requirements for my Electric Front-Load Dryer, 7.5 cu.ft (DV50K7500EV)?